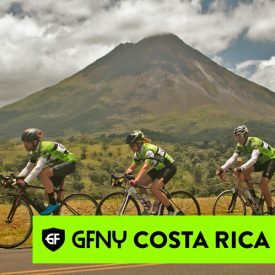 NEW YORK CITY, April 19, 2018 – The city of La Fortuna, Costa Rica hosts the inaugural GFNY Costa Rica this Sunday, April 22. The inaugural edition of GFNY Costa Rica is set to be a thrilling new edition to the GFNY global marathon cycling series. Host city La Fortuna is where the event starts and finishes. During the 150km long route riders will pass through the stunning Arenal Volcano National reserve. Here a demanding 17km climb will take riders to the Lake Arenal dam before heading down through an undulating course through scenic vistas and the villages of Nuevo Arenal, Tilaran, Cañas before heading back to La Fortuna and the finish line. The medium route of 90km also starts and finished in La Fortuna and takes riders up and down the Volcano. The route poses a challenge in both terrain and the elements with part of the course passing through the Tejona windmill energy projects. Here riders will undoubtedly face a myriad of testing conditions for a 6.7km uphill section.